Today’s entry is another family musical from the team of Leslie Bricusse and Anthony Newley, the same pair that scored 1967’s Doctor Dolittle. Adapted from Roald Dahl’s novel Charlie and the Chocolate Factory, the film tells the story of Charlie Bucket, a poor boy who lives in a small cottage with his mother and both sets of bedridden grandparents. 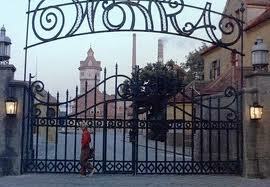 The Buckets’ town is also home to the world-famous Wonka chocolate factory. The factory’s owner and manager, Willy Wonka, is a mysterious recluse, and the factory itself is enigmatic as well. For years, no workers have been seen entering or exiting the building, and yet candy production continues full-steam. One morning, Wonka suddenly breaks his silence. He announces to the world that he has concealed five golden tickets under the wrappers of five chocolate Wonka Bars. Each person who finds a ticket will be invited on a grand tour of the never-before-seen Wonka factory, and receive a lifetime supply of chocolate. Charlie is excited by the contest, but disheartened that his family’s poverty precludes him from buying the huge quantities of candy bars that millions around the world are frantically snatching up in their search. The days tick by, and ticket-finders begin popping up: Augustus Gloop, a gluttonous German boy; Veruca Salt, a spoiled English Girl; Violet Beauregarde, an American girl who constantly chews gum, and Mike Teavee, a none-too-subtly named boy obssessed with television. Charlie is depressed when the last ticket is supposedly found in Paraguay, but a glimmer of hope returns when this last “winner” is revealed as a hoax. Rushing to the candy shop with a silver piece he finds in a gutter, Charlie purchases a Wonka Bar – which holds the final Golden Ticket. Before he can run home, Charlie is approached by a sinister man whom we have seen previously in the background of news reports on the previous four ticket-finders. He introduces himself as Slugworth, a rival confectioner to Wonka. He promises Charlie a large sum of money in exchange for Charlie delivering him a sample of Wonka’s latest invention, the “everlasting gobstopper.” The flustered Charlie hurries home. Grandpa Joe (Jack Albertson), one of Charlie’s bedridden forebears, jumps up at Charlie’s news of finding the last ticket. 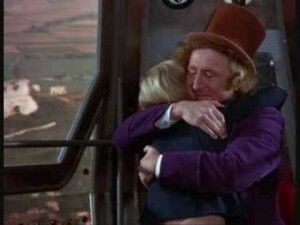 He agrees to accompany Charlie on the Wonka tour, and the appointed morning finds the two of them huddled outside the factory gates alongside the other four winning children and their parents. At the chime of the clock, Willy Wonka (Gene Wilder) makes a grandiose, but very strange, appearance. He hobbles out of the factory leaning on a cane, only to suddenly toss the cane aside and perform a perfect somersault, leaping to his feat. 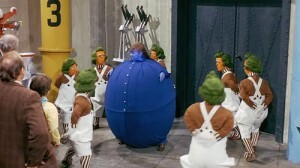 This “trick” serves as the perfect introduction to Wonka’s eccentric, deceptive, and even somewhat menacing character. Wonka ushers the young winners into the factory to begin the tour, and this is where things get good. 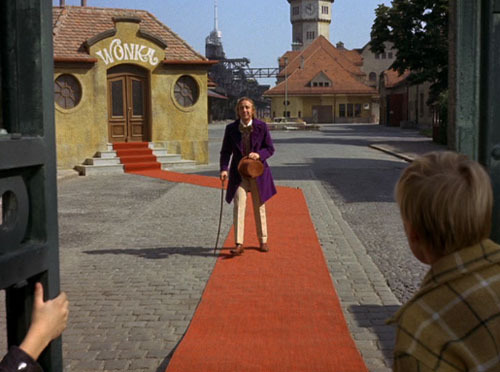 After having the children and parents sign a “simple” contract, Wonka begins the tour with the “Chocolate Room,” a miraculous room bisected by a river of liquid chocolate, “churned by waterfall.” Here we learn that the factory has stayed in business due to Wonka’s recruiting the “Oompa-Loompas,” a bizarre race of helpful orange-skinned midgets. In one of the film’s most magical scenes, Wonka sings about how he has striven to create a world of “Pure Imagination,” while the winning families dart around the fantasmagorical Chocolate Room gobbling every “scrumdiddlyumptious” sweet in sight. Things quickly take a dark turn when Augustus is sucked up a pipe after falling into the chocolate river. 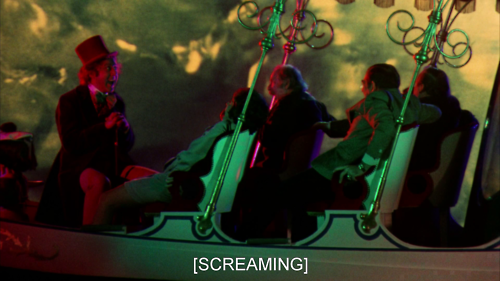 To “calm” the remaining group members, Wonka takes them on a peaceful boat ride…which rapidly becomes a vaguely nautical-themed descent into Hell. As the group zooms through a dark tunnel, rings of technicolor lights flash, accompanied by flickering scenes of a chicken being beheaded and a man with a large millipede crawling across his face. In a wild voice, Wonka begins reciting a poem about the “the fires of Hell a-glowing” and “the grisly reaper mowing,” before simply breaking into a terrifying high-pitched scream. Then, the boat abruptly stops, and everything is seemingly normal again. But deep down, we know that, after that, nothing will ever truly seem “normal” again. As the tour continues, the rest of the children are undone by giving in to the temptation of their respective obsessions (Violet swells into a “blueberry” after chewing a piece of experimental gum, Mike Teavee is shrunken when transmitted via “Wonkavision” into a TV set, etc.). The group thins until only Charlie remains. Wonka denies him his prize, though, citing a scene in which he and Grandpa Joe snuck away to try “fizzy lifting drinks” against Wonka’s orders and were nearly killed by flying into an industrial fan as “breach of contract.” Joe is incensed, and encourages Charlie to give Wonka’s gobstopper recipe to Slugworth. 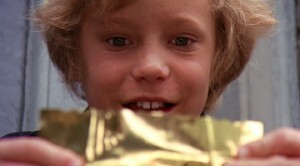 Instead, Charlie returns the candy to Wonka – who ecstatically exclaims that Charlie has “passed the test.” The entire Golden Ticket contest was really a means for Wonka to test the moral scruples of children, so that he might find a suitable successor to one day take over his candy empire. 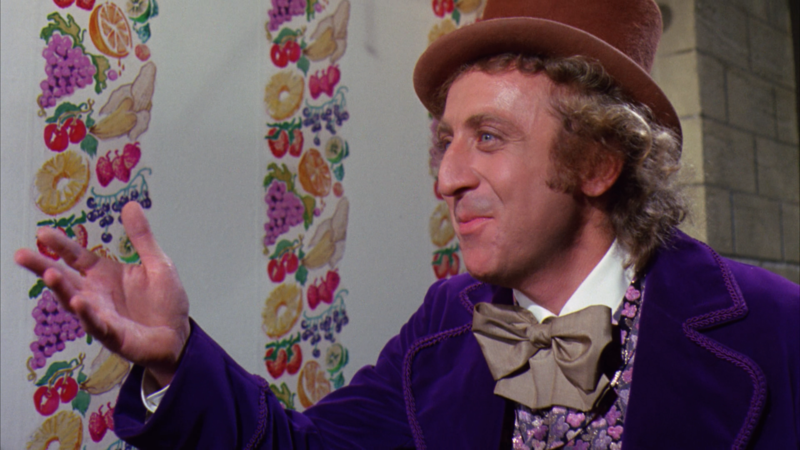 Not only the chocolate, but the whole Wonka enterprise will some day belong to Charlie and the Buckets. In celebration, Charlie, Joe, and Wonka soar away toward Charlie’s house in Wonka’s “great glass elevator” while the credits roll. I like this film for many of the same reasons I lauded Chitty Chitty Bang Bang. It’s full of vibrant visuals (the explosive colors of the factory provide stark contrast to the bleak, muted tones of Charlie’s unremarkable little town). 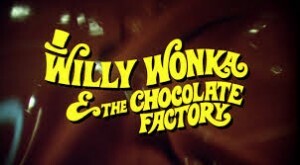 The songs are good for the most part, with “I’ve Got a Golden TIcket,” “Pure Imagination,” and the downright creepy “Oompa-Loompa” song which follows each child’s downfall being the real showstoppers. And once again, this is a film which successfully creates a feeling of magic: that the impossible truly is possible. From the moment the song “The Candyman Can” introduces the as-yet-unseen Willy Wonka, he’s regarded as a wizard, a miracle-worker, a veritable god of candy. In Wonka’s factory wonderland, “my dreams become reality, and some of my realities become dreams.” That’s what great films do…for a few fleeting moments, “movie magic” makes dreams a reality, and sometimes vice versa. 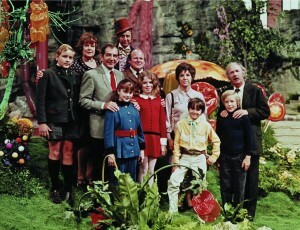 -Author Roald Dahl disowned the film. He hated the changes the scriptwriter made to his story, particularly the choice to add the “fizzy lifting drinks scene,” which muddies Charlie’s image as a supposedly moral, upstanding youth. 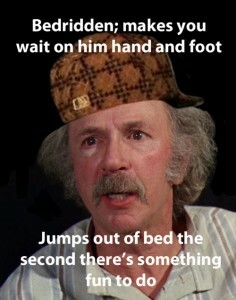 -On that note, I’ve read a fan argument that Grandpa Joe is the true “villain” of the film, encouraging Charlie to steal the drinks in the first place, and then to betray Wonka in the end. Charlie shows his moral strength by overcoming the temptations represented by his grandfather. -In the book, Charlie lives with both of his parents, but in the film he suffers from the lack-of-parent syndrome so common among family musical protagonists. Truly the most high-casualty occupation is “parent of a Disney (or Disney-esque) protagonist.” Crab fishermen have nothing on them. -Anthony Newley hoped to play a role in the film, as he had in “Dolittle.” Specifically, he wanted to portray Bill, the “Candyman” in the beginning of the movie. Apparently Newley had enough “star power” in the early 70s that the director worried his cameo would distract audiences from the more prominent, but less well-known, actors in the film, and so he ultimately was not cast. -This is another one where I strongly recommend tracking down the blu-ray. If the colors were eye-popping on the Chitty Chitty Bang Bang blu-ray, the breathtaking hues revealed in the Wonka blu-ray had me tasting schnozz-berries.